Tart cherry juice is made from a small, red fruit with great health benefits. Tart cherries also known as sour cherries (Prunus cerasus) are closely related to the sweet cherry (Prunus avium), but have fruits that are more acidic, have greater nutritional benefits and greater medicinal effects. Tart cherries are sometimes called Montmorency cherries and you should be aware that this type of cherry is just a variety of tart cherry grown in the United States, Canada and France, particularly in Michigan and in Door County, Wisconsin. All cherries contain anthocyanins – a plant pigment that gives them their vibrant color and is found in red and purple fruits. Anthocyanins have powerful antioxidant and anti-inflammatory properties, and tart cherries contain the highest level of this potent red pigment, thus have the strongest healing potential. Tart cherries, are rich in vitamins A and C and abound in beta carotene. They are indeed a super food, and can be consumed in many different forms: fresh, dried, frozen, as a juice or in an extract form. 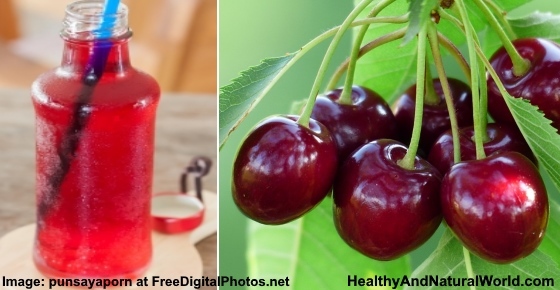 Tart cherry juice is such a potent pain reducer and anti-inflammatory that it is comparable to ibuprofen and naproxen but without all the side effects1 (see other natural alternatives for ibuprofen). The anthocyanins in cherries naturally reduce inflammation. Anthocyanins can also protect against chronic conditions that are associated with inflammation, such as diabetes, cardiovascular disease, cancer, Alzheimer’s disease and metabolic syndrome2. Tart cherry juice contain two powerful compounds, anthocyanins and bioflavonoids (special type of antioxidants) that help to relieve and prevent joint pain and gout. According to a study conducted at the Baylor Research Institute, tart cherries were able to improve pain and function in patients with osteoarthritis of the knee after 8 weeks of oral supplementation3. Another study conducted by a research team from Oregon Health and Science University checked twenty women with inflammatory osteoarthritis (OA). The participants were asked to drink tart cherry juice twice a day for three weeks. After that, their inflammatory markers were checked. A significant reduction in marker levels was observed, especially in women with the more severe presentation of this condition10. A third study was done by Boston University Medical Center researchers who looked at the potential cherries have in the treatment of gout. 633 participants had at least 10 cherries a day. This resulted in a 50% lower risk of gout flares over a 48-hour period, and the scientists believe the benefits to last over a longer period of time9. Further reading: If you suffer from knee osteoarthritis, you can also try this natural extract or this seed. For other natural gout treatments read my other article. Cardiovascular disease occurs as a result of elevated low-density lipoprotein (LDL) cholesterol levels. Tart cherries may prevent cardiovascular disease by lowering triglyceride and cholesterol levels. Tart cherry juice is high in flavonoids, a type of antioxidant that helps to boost the immune system. According to research published in the journal Biochemical Pharmacology, the flavonoids found in tart cherry juice can improve the immune system4. Further reading: Read my article about other natural substances to boost your immune system, and 10 quick life hacks to improve your immunity almost immediately. The antioxidants found in tart cherry juice have been shown to turn off genes that are involved in cancer. They may also be able to inhibit the growth of tumor cells. Research indicates that there is a unique relationship between anthocyanins and phenolic acids (protective compounds found in plants) that gives tart cherries their potential anti-cancer properties. According to research published in Cancer Letters, the anthocyanins found in tart cherry juice was able to reduce the growth of colon cancer cell lines5. Further reading: Read about how ginger can be used to treat cancer, and how to consume flaxseeds to prevent colon cancer. Many neurological conditions such as Parkinson’s disease, Alzheimer’s disease, Huntington’s disease, and ALS are caused by aging and oxidative stress. Tart cherry juice is high in antioxidants that may have protective properties against these cognitive declines. According to a study published in the Journal of Agriculture and Food Chemistry, tart cherries contain a high content of phenolics such as anthocyanins that have strong anti-neurodegenerative activity6. Further reading: Read about the fruit which can halt Alzheimer’s, Parkinson’s and Rheumatoid Arthritis, and about these top 5 foods and supplements to delay Alzheimer’s disease and dementia. A high fat diet is often responsible for the development of metabolic syndrome, which precedes type II diabetes. According to research published in the Journal of Food Medicine on 2009, obese rats that were fed a diet of whole tart cherry powder had a reduction in fat mass including weight around the stomach area, a reduction in hyperlipidemia (fat in the blood), and reduced inflammation, as well as other helpful metabolic changes7. The study indicated that tart cherries may reduce the risk of developing type II diabetes. Further reading: Read about the best 14 foods to control type 2 diabetes and how to use apple cider vinegar for diabetes. The high antioxidant content in tart cherry juice may help your recovery from a tough workout quicker. Tart cherries are high in the electrolyte potassium, which is needed to conduct electrical impulses throughout the body. It also helps with hydration as well as maintaining blood pressure, muscle recovery, digestion, heart rate, nerve impulses, and pH levels. Tart cherries contain approximately 330mg of potassium per 8 ounce glass to give you 10 percent of your daily recommended intake. According to a 2010 study published in the Journal of Agriculture and Food Chemistry, the active compound in cherries known as anthocyanins was responsible for acting against the development of obesity8. Anthocyanins act as an antioxidant in the body to eliminate free radical toxins from accumulating and causing inflammation. They work by naturally detoxing these toxins and moving wastes out of the body, which may promote weight loss by getting rid of harmful substances in the body. Further reading: Read about the spice that helps you lose body fat and how to use lemons to lose weight. The research team found that adults who drank two 1 ounce servings of tart cherry juice per day experienced a demonstrable increase in sleep efficiency. The researchers found that the participants who received the tart cherry juice napped less, slept longer, and spent more of their time in bed asleep. Additionally, the tart cherry juice group showed increased levels of melatonin, the hormone that helps regulate the sleep-wake cycle, indicating that drinking this juice boosts the body’s melatonin levels which may explain how tart cherry juice works. Tart cherries are high in many healthful properties, including flavonoids, anthocyanins and phenols that protect against inflammation, decrease the risk for developing a chronic disease, and improve the immune system. Tart cherry juice is considered safe when taken in moderate serving sizes, such as an 8 ounce glass per day. While the anthocyanins in tart cherries may be useful to treat specific conditions, they can be used to promote overall health by combating inflammation, which is the underlying cause of many modern day ailments. You can use tart cherry concentrate (like this one) or tart cherry tablets (like this one) and you can even try to experiment with tart cherry extract powder (like this one). When looking for tart cherry juice in your supermarket, look for a brand that does not add sugar as this can turn an otherwise healthy juice into a high calorie, sugar-laden drink. You can drink tart cherry juice straight from the glass or add it into your favorite smoothie recipe.